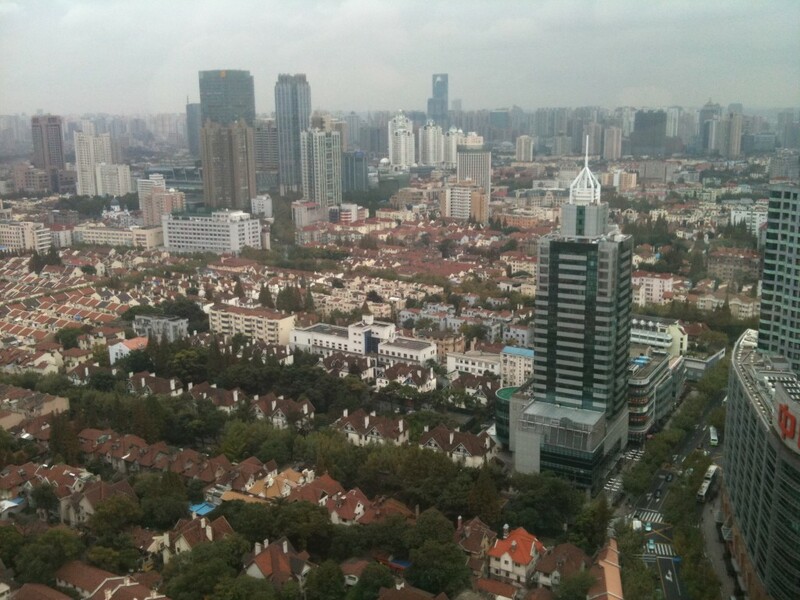 I pulled myself out of bed to the coffee maker where I brewed a fresh pot of coffee, fried up some eggs and looked out the window to my city-sprawl view of the Jing’an district. For a Japanese person, K was incredibly spontaneous. He often called me at a moment’s notice to whisk me away to some unknown restaurant or bar in Shanghai. “Just study another time,” I could hear excitement in his voice. “There’s somewhere I want to take you. Meet me at Yongjia Road in 20 minutes.” He hung up. 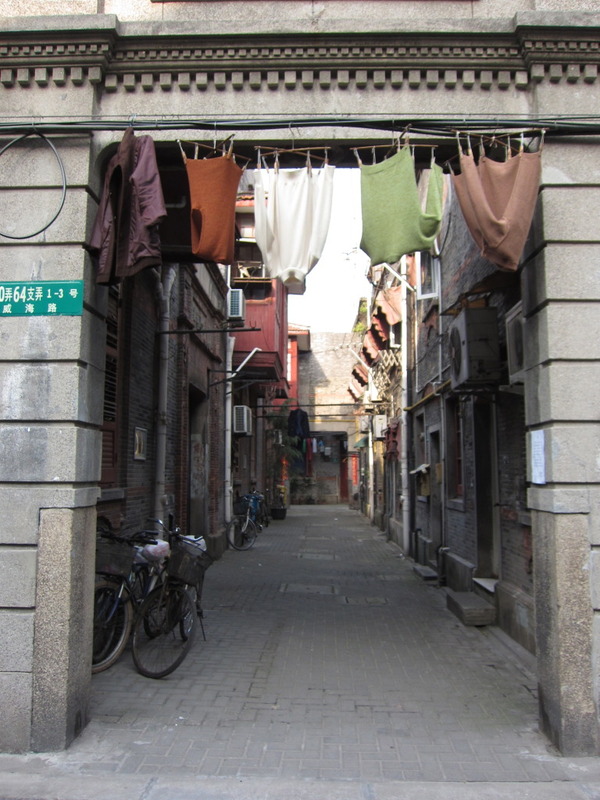 Each street in the French Concession within Shanghai is a unique destination with a special trademark to it, and Xiang Yang South Road was no exception. Xiang Yang South Road, sometimes referred to as “tea street,” is where most tea vendors in Shanghai set up their tiny shop to do business. From low to high-end, Xiang Yang South Road offers a range of teas for any occasion. On my last visit I even discovered a Turkish teashop run by an ex-pat from Turkey and his Chinese wife, serving beautifully handcrafted tea cups as well as Turkish goodies and Hibiscus tea–a rare find in China. Xiang Yang South Road is also one of those perfect places to take an afternoon stroll. Despite being in the center of the city and the heart of the French Concession, Xiang Yang South Road is fairly quiet and reserved, with few bikes and even less cars. A real jewel of Shanghai. Although it was one of my favorite parts of town, Xiang Yang South Road wasn’t exactly new to me. As K and I walked up the street, I looked at him suspiciously. It was an alley entrance marked with the sign 大可堂 (Da Ke Tang). I peeked around and didn’t see anything. Throngs of people walked past without a glance. “Oh, you’ll see,” K walked down the alley, beckoning me to follow. 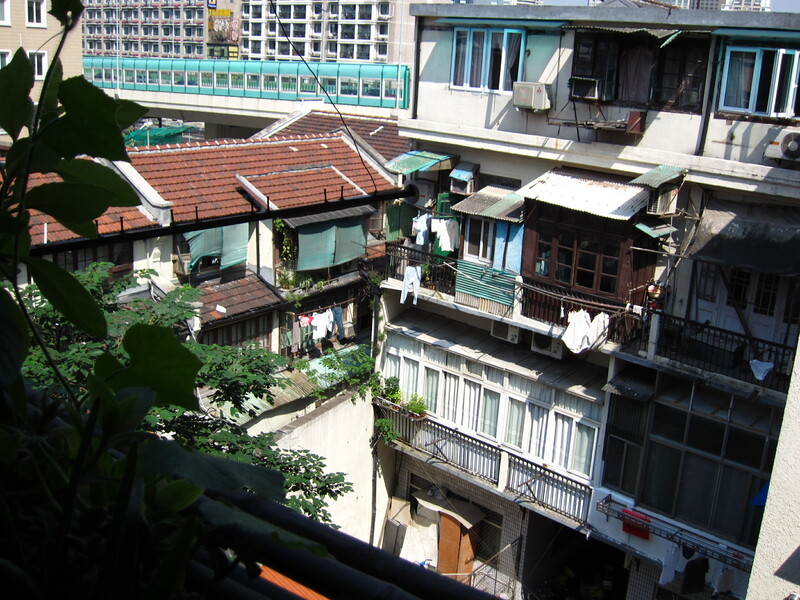 A few short steps later, the concrete beneath my feet turned to grass and I found myself standing in a small garden, face-to-face with a huge Shanghainese manor called Da Ke Tang, tucked away without a trace. I was speechless. “Welcome to the tea house Da Ke Tang,” K said with a smile. Although China is famous for tea, the art has been severely warped by the tourism industry making it difficult to find a proper tea house that isn’t trying to wheel and deal you—well, wheels of tea. In the past I often participated in these China “tea experiences” where a 5 minute tea demonstration was quickly followed up with a 1 hour stop to the gift shop downstairs. 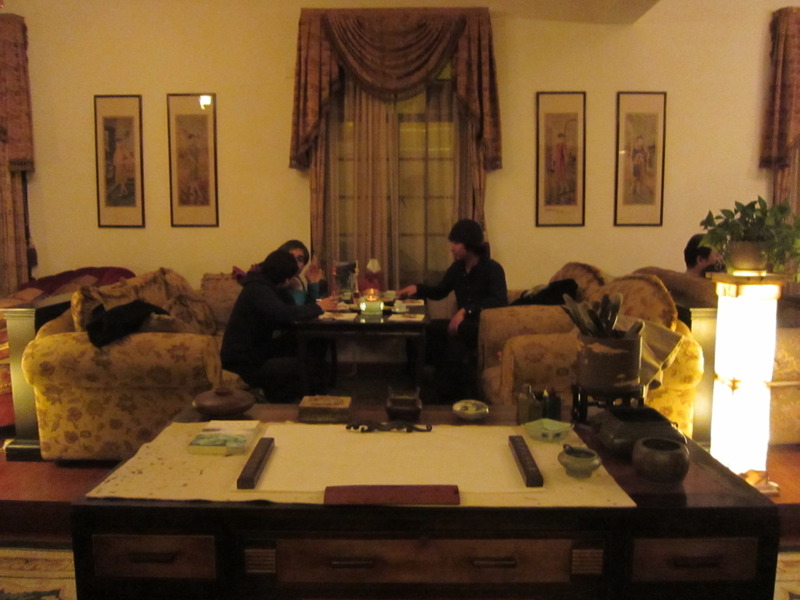 Finding a place to enjoy high quality tea in China, ironically, is not easy. 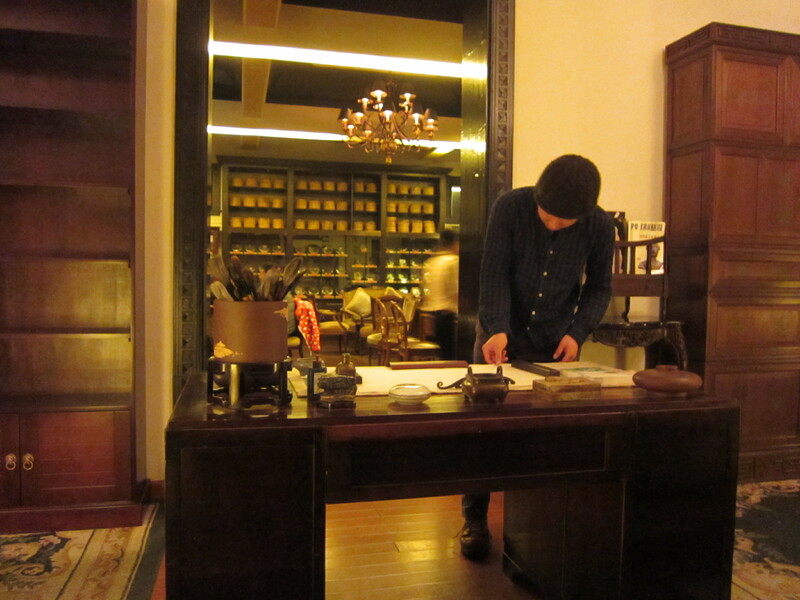 That’s why discovering Da Ke Tang was like finding the holy grail of tea service in China. 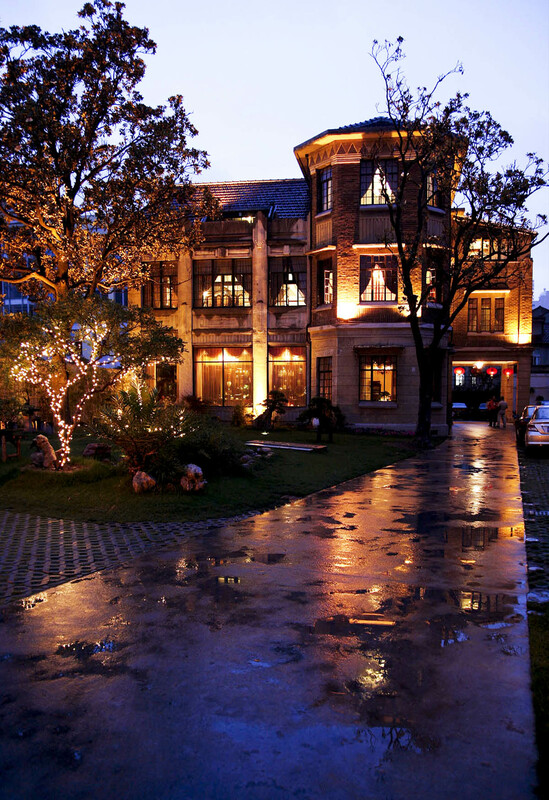 Da Ke Tang, an old 1930’s manor converted tea house, is a three-floor masterpiece of history and Shanghai culture. Although the building is western by design, going inside feels like you’ve taken a step into 1930s Shanghai. Old sonophones with records from Zhou Xuan and other famous Chinese jazz artists lie next to antique calligraphy sets, wooden pipes, and beneath crystal chandeliers hanging in the air. Guests at Da Ke Tang can choose to enjoy tea at a wide booth near the large pane windows overlooking the garden, or they can sit in the library to browse the old records, books, calligraphy sets and tea history that the manor has preserved for years. 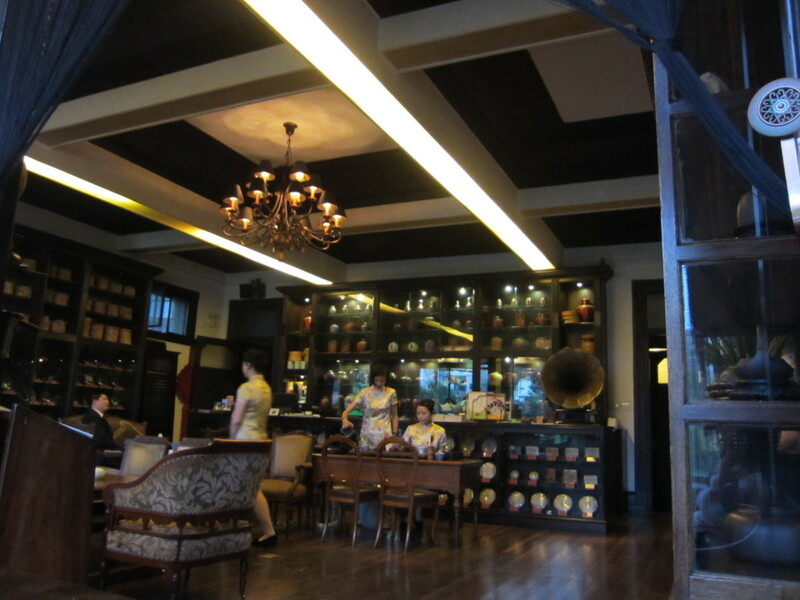 In the center of the teahouse is a bar lined with different blends of aged pu’er, manned by servers donned in qipao pouring the tea with a refined grace befitting an aristocratic Shanghainese woman of the 1930s. At Da Ke Tang they only serve one kind of tea, and it’s pu’er. The four page menu of pu’er can be confusing to even the Chinese eye, so when K and I received the menu we focused on the numbers and ignored the Chinese characters. 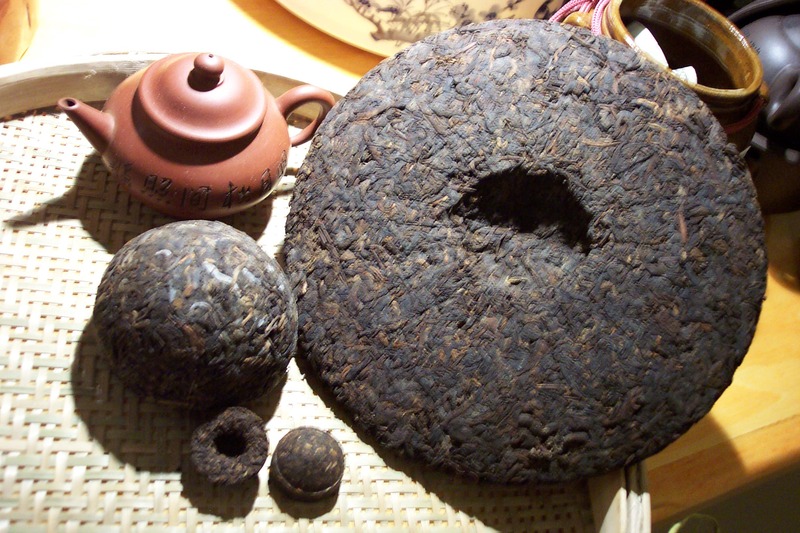 Da Ke Tang carries pu’er aged for hundreds of years from Yunnan, but it aint cheap—some tea there can even run you a thousand dollars. (The tea we got was 20 bucks a pot). But the quality of the tea here (even the cheapest one) is absolutely superb. Although the tea is exceptional, I guess that most people come here for more than just pu’uer. Guests mostly spend the afternoon here in order to transport themselves to another world within Shanghai, the one that you all but thought disappeared with the cultural revolution. Since Shanghai’s richest and most elite usually occupy Da Ke Tang, the establishment delivers nothing but a stylish, quiet, and luxurious experience perfect for a business meeting or a simple date. Needless to say, that wasn’t our last visit to Da Ke Tang. Every 1-2 months K and I would come to Da Ke Tang, recline on the booth, look out to the garden, sip on our high quality pu’er and talk for hours—we were in Shanghai, yet we were a world away from its busy streets, noisy crowds, and throngs of tourists. It was the perfect way to escape the stress, worry and problems of a big city, even if it was only for an hour or two. Although all I did was sit at a table near a window, listen to some classical Chinese music and sip a few cups of pu’er; those memories within Da Ke Tang are golden to me. It’s an experience uniquely Shanghai, and no trip there should go without it. Oh wow that’s really amazing! 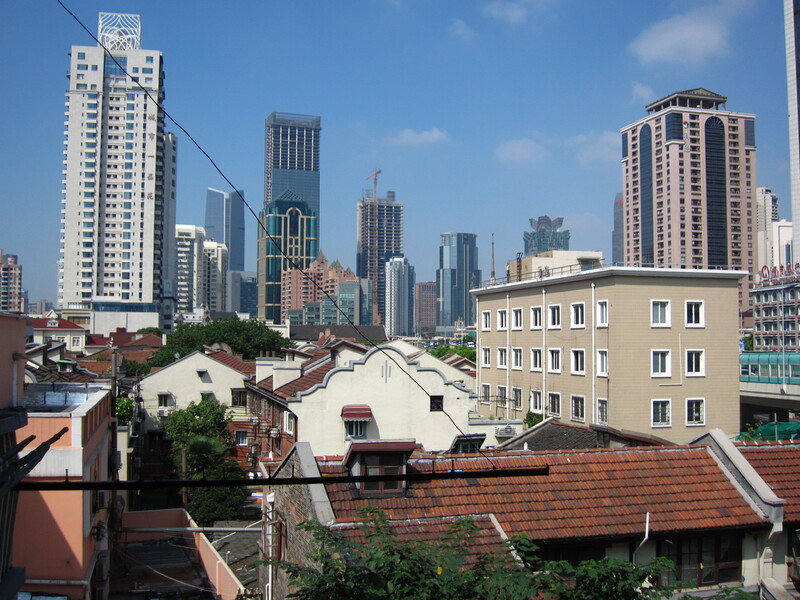 I’ve never been to Shanghai – I’d love to go to study Chinese there like you! Yes! You should definitely go!! China is such an amazing place and it’s a total 360 from Japan. 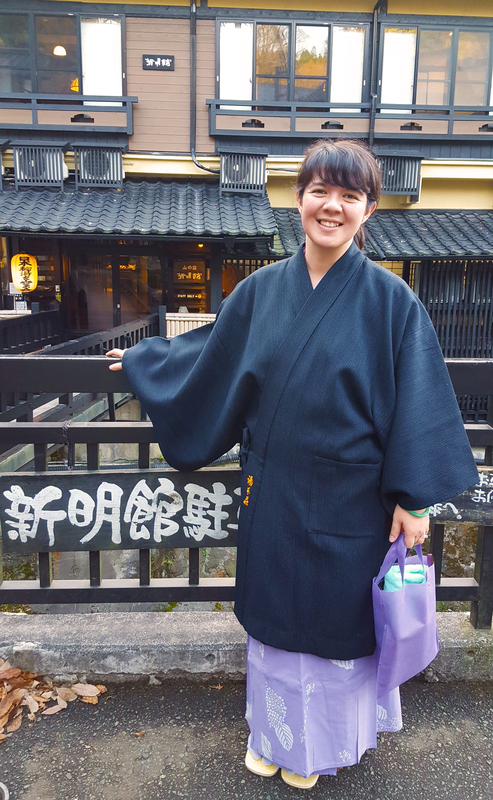 Because China and Japan are neighbors, share an alphabet and have some cultural similarities, I thought that I would be ready for China–but I wasn’t. It’s SOOO different. Since you can speak Japanese, I bet you’d pick up Chinese super fast, too!